CNG: The Coin Shop. IBERIA, Punic Iberia. Circa 237-209 BC. AR Quarter Shekel (14mm, 1.86 g, 12h). IBERIA, Punic Iberia. Circa 237-209 BC. AR Quarter Shekel (14mm, 1.86 g, 12h). Laureate male head left; club over shoulder / Elephant standing right. MHC 45–58; ACIP 555; SNG BM Spain 102. EF, toned. Good metal for issue. In 241 BC, the Carthaginians, under Hamilcar Barca, were defeated in a naval battle off Lilybaeum, effectively ending the First Punic War. The peace terms Barca negotiated with Rome allowed him to withdraw his troops to Africa on the agreement that Carthage abandon all claims to Sardinia and Sicily, refrain from sailing her warships in Italian waters, and pay an indemnity of 3,200 talents. In response, the Carthaginian oligarchy redirected its expansionist policies toward Africa and Spain, and reappointed Hamilcar as commander of Carthaginian forces. In 237 BC, after putting down the revolts of Spendius and Matho in northern Africa, he was sent to Spain with his young son, Hannibal. Based at Gades, he conquered southern and eastern Spain, advanced the frontier to Cape Nao, and built a fortress at Acra Leuce (Alicante). The Carthaginians spent the next twenty years solidifying their rule in Iberia, during which time, in 228 BC, Hamilcar fell while battling the defenders of Helice (Elche). The leadership then passed to Hasdrubal the Fair, who was married to Hamilcar's second daughter. Unlike his father-in-law, Hasdrubal preferred to consolidate the areas that had been conquered rather than continue an expansionist policy. This led him to conclude a treaty with Rome that established the boundary of the two powers at the Ebro River (Livy XXI, 14). Hasdrubal proved far more diplomatic than Hamilcar, pursuing negotiated settlements with native populations, rather than subjugating them. Unfortunately, he was assassinated in 221 BC, whereupon power shifted to his brother-in-law, Hannibal. Hannibal, more in line with his father, returned to a policy of conquest, which led to war with Rome. In an attempt to check the rising power of Carthage in Spain, Rome made an alliance with Saguntum, a city on Rome's side of the Ebro River. Within the city there were factions supporting a pro-Carthaginian policy, while another favored Rome, and tensions between the two led to a massacre of the Carthaginian supporters in 218 BC. Outraged, Hannibal and the Carthaginians laid siege to the city, which fell after a few months time. Effectively breaking the treaty forged by Hasdrubal the Fair, this act precipitated the Second Punic War. While most popular histories concentrate on the actions of Hannibal in Italy, there were continuous Roman campaigns against the Carthaginians in Iberia, most famously those led by Scipio Africanus. By 209 BC, the Romans had captured the Carthaginian capital and most of Iberia east of Lusitania. While the war continued on, the Carthaginians had lost all of their access to mints in Iberia by this time. In the wake of her defeat in the First Punic War, the coinage of Carthage had been greatly changed, with its extensive gold and electrum series mostly replaced by debased silver and bronze. In contrast, the Carthaginians in Iberia enjoyed access to the rich gold and silver mines on the peninsula, which allowed the Barcids to develop a coinage that served their military and political needs. 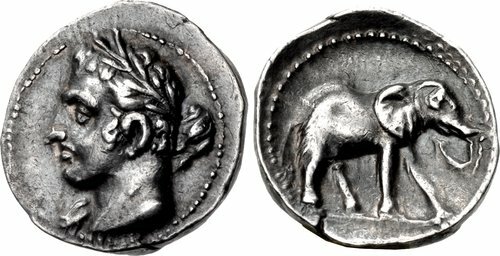 The obverse and reverse types chosen for this coinage were purely Carthaginian in character, often featuring Tanit on the obverse and a horse, often with palm tree or uraeus, on the reverse. In addition to these traditional types, some new, albeit Punic, types were introduced: an elephant, sometimes with mahout, and a ship's prow were placed on the reverse, while the god Melkart, laureate, sometimes bearded, and with club, was added to the obverse. Perhaps the most controversial new types, though, were those that featured a beardless male portrait, sometimes wearing a royal diadem. The initial tendency of numismatists was to view these portraits as being those of the Barcids, but the modern consensus is that the bareheaded portrait is almost certainly a rendition of a young Melkart. A comparison of three different varieties of Melkart in SNG BM Spain (nos. 97, 98, and 103) is demonstrative of their nearly identical features. The diademed portrait, though, is still an enigma, for, unlike depictions of Melkart, these have a distinct aspect of realism to their features, and the diadem itself is difficult to reconcile with the traditional depictions of Carthaginian deities. Although there are numerous series of Punic coinage in Spain, their specific chronology is uncertain, typically being placed in the period circa 237-209 BC. Likewise, the place of their minting is also unknown, although some, if not most, must be from the capital at Carthago Nova.